Excellent views Daulagari and Annapurna Ranges. Flight with stunning mountains from pokhara to Jomsom. 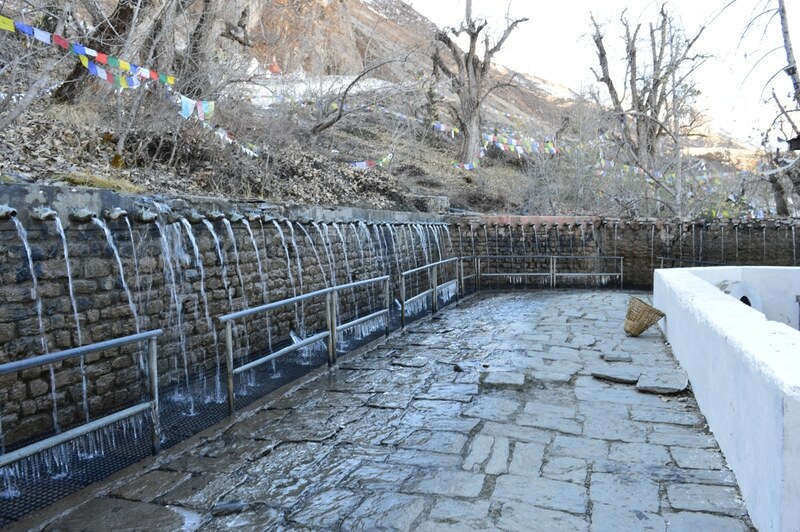 Visit site of Hindu Pilgrimage Muktinath. Visit ethnic Village settlements of Thakali People. Bath on natural hot water spring at Tatopani. Kali Gandaki Muktinath trek leads through ancient salt trading route between Tibet and Nepal through the deepest Valley of the world (6900m) between Dhaulagari and Annapurna mountains. We fly from the beautiful valley of Pokhara to Jomsom (2700m) from where our trek begins towards the famous site of Hindu Pilgrimage Muktinath (3800m). On the way back we pass through the villages Marpha, Tukuche and Tatopani (Hot-Water spring) ethnic settlements of Thakali People. While descending down to Pokhara, we cross Ghorepani (2800m), one of the highlights of this trek is the Punhill (3210m) from where one can enjoy unprecedented sunrise reflecting on the icy peaks of Dhaulagari and Annapurna. Trek ends at Nayapul and short drive to Pokhara. On arrival, a representative from Amazing Himalaya will receive you at the airport to take you to your hotel. Overnight in Kathmandu. Today, we will visit Kathmandu Durbar Square, Patan, and Swayambhunathstupa which are all in UN World Heritage sites. Durbar Squares are conglomerate of ancient courtyards, palaces, and temples that gives glimpses of the life of the royals in ancient Nepal. Swayambhunath is also known as the Monkey Temple, it is on top of a hill, and has historical significance associated with the foundation of Kathmandu valley. Patan, also one of the oldest Buddhist cities in the world, is home to ancient temples and palaces. Patan is also known as Lalitpur, which means beautiful city in an ancient local language. Today we have to prepare your special permit for Mustang. Overnight in Kathmandu. After breakfast, we will drive through a gorgeous mountain landscape, past peaceful villages, to Pokhara (200 km). If the weather permits, we can see a stunning view of Annapurna massif and Mt. Manaslu over the course of this 7-hour drive. Overnight in Pokhara. After breakfast, we will head towards the airport to fly to Jomsom. It’s a very short flight of 20 minutes. Enroute to Kagbeni we will walk for 2-3 hours through the most ancient trade route to Tibet. In the afternoon in Kagbeni, we will come across Buddhist Gumbas, Stone Houses, and Dark alleyways of sturdy Tibetan population. Kagbeni is the gateway to Mustang. Overnight in Kagbeni. Day 05: Kagbeni – Muktinath. Today we hike steeply uphill into the lateral valley of Jhonkhola and go through fruit & vegetable fields up-to Muktinath. 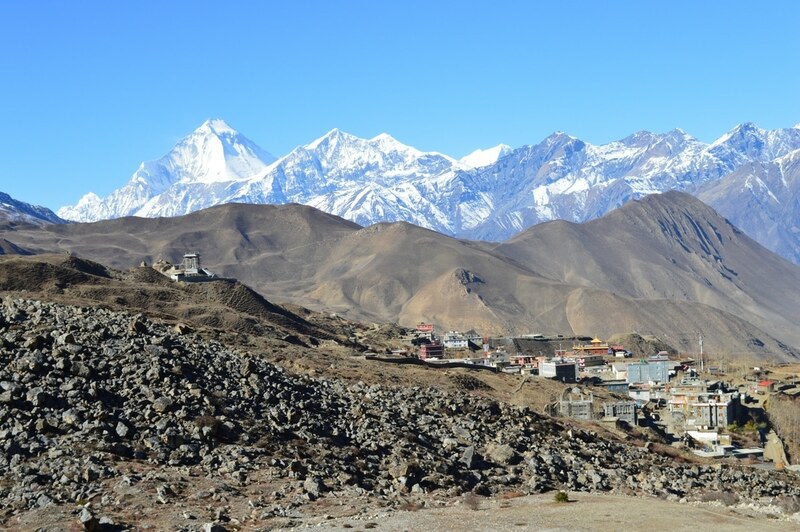 Around noon we will arrive in Muktinath. In the afternoon we can also hike few hundred meters towards Thorong Pass, then back to Muktinath. Overnight in Muktinath. Day 06: Muktinath – Jomsom – Marpha. Today we will make our way back to Marpha via Jomsom. We take a shorter path with a pass of about 3800m. Then we will go to Panda Khola and from here we will climb up-to main Jomsom valley. We will walk another 2 hours to reach Marpha. The locals here, ethnically known as Thakalis, have still inherited their traditional business of apple farming, brandy brewing, and poultry farming from their ancestors. Overnight in Marpha. Day 07: Marpha – Kalapani. Day 08: Kalapani – Ghasa- Tatopani. Today we will go through various iconic places of the circuit including Lete-Ghasa, Kali Gandaki gorge, and eventually Tatopani where we will finally experience sub-tropical climate again. Lete-Ghasa is a very popular village, the tradition and custom of the locals here have helped preserve the very unique culture of this village. Kaligadaki is the deepest gorge in the world, while Tatopani is a natural hot spring found in this kind of altitude. Overnight in Tatopani. Today we will take the daunting task of trekking up to the steepest trekking trail via Shikha and Chitre. On our way, we will come across different local ethnic groups who have been living on these steep slopes for generations. Overnight at Trekkers lodge. Today we will wake up early to walk up to Poonhill (3232m) to witness the beautiful early morning sunrise out of Mt. Dhaulagiri, Annapurna range, and Manaslu Mountain. After enjoying the sunrise, we will get back to the lodge for breakfast. After breakfast, we continue our 4-5 hours trek to Hille. Overnight at Trekkers lodge. We start this trek in the morning after breakfast in Tikhedunga toward Nayapul for about 4 hours with lunch on the way. Then you will be taken to Pokhara in a private vehicle where you will be accommodated. Overnight at Hotel in Pokhara. After breakfast, your trip starts with a drive back from Pokhara to Kathmandu by private coach for about 6 hours. Overnight at Kathmandu. After breakfast, we will go for a half-day sightseeing tour to the most beautiful city in Kathmandu valley called Bhaktapur. Bhaktapur is also listed in UN world heritage site. Here you can see the Durbar Square, the pottery market, the famous peacock window, as well as the five-story Nyatapola: Nepal’s highest pagoda. Drive back to Kathmandu. Rest of the day you have free time for shopping or walk around Thamel. Overnight in Kathmandu. Day 14: Final Departure: We will drop you at the airport to bid you nice farewell. All overland drives by tourist / private vehicle . All hotel accommodation with breakfast. Sightseeing with all entrance fees. Trek Permit, National park and conservation fee. English Speaking trekking guide and porters on Trek. Flight from Pokhara – Jomsom . Flights to and from homeland.